Harvest is one of the best times of the year. However, when it comes to maintaining the quality of the grain after harvest, the work hasn’t even started. If you asked any farmer, they would agree that harvest is one of the best times of the year. Nothing brings that overwhelming feeling of satisfaction quite like watching the combine hopper fill with the fruits of their labor. During this time of “harvest celebration” it may be easy for one to think all the work is done. However, when it comes to maintaining the quality of the grain after harvest, the work hasn’t even started. Innovations in storage facility construction, as well as research related to aeration technology have greatly improved the quality of grain in storage. However, some of most important grain quality factors are beyond the control of the best storage considerations. Excessive rain, lack of rain, poor fertility and pest damage are among the multitude of problems grain buyers “inherit” and are forced to manage. Growing conditions, from the time crops are planted until maturation, can often influence the quality of the grain. Where the grain is grown, tillage practices and local weather conditions all impact the growth of the plant and ultimately the quality of the grain. One emerging consideration is the agronomic practices and the impact contaminants on the soil surface impart on the grain.1 Reduced tillage practices leave trash on the soil surface, a good thing for soil quality, but the mold, yeast and other microorganisms in the residue can have a large impact on crop quality. These mold spores, once introduced to the storage facility, can reduce the nutritional value of grain and impact vitamin and mineral levels within the grain. It is important to remember, that once grain goes bad, there is nothing we can do in storage to turn back time. As previously mentioned, the growth of mold reduces the energy concentration of the grain by consuming those nutrients to help aid the molds growth. Certain mold species can also produce defensive chemicals called mycotoxins. These mycotoxins have a significant impact on livestock performance and reproduction. Drying grain to below 13% moisture helps to reduce the chance for mold growth, however, aeration of the grain mass is critically important. We must not forget, grain in long term storage is subject to moisture migration.2 Over time, heating of the grain bins cause moisture to move upward thru the grain mass. Once the moisture reaches the top of the grain, the concentration of this moisture leads to hot spots where mold and wild yeast growth flourish. Anyone who has cleaned out a grain bin is familiar with the “clods of corn” found along the sides of bins and across the top of the grain mass. Proper aeration can prevent much of this moisture migration. Pests are another concern in storage. In the U.S., we are fortunate to have a wide variety of exceptional pesticides to control profit robbing pests. The problem is we do not always use the right pesticide to control the pests present. Pest damage from the field is beyond the control of livestock producers. However, before grain goes into storage, the application of a broad-spectrum pesticide can prevent damage associated with many of these insects. Fully remove all grain and any residual mold from storage facilities before introducing new grain to the facility. Once the facility is ready to receive grain, consider an application of pesticides, miticides or fungicides to reduce the growth of these pests. Apply a blend of organic acids to the grain to prevent mold and wild yeast growth. Only store grain below 13% moisture. Plan aeration times communicate the timetable with all employees to ensure moisture migration is mitigate. Since so much of the supply chain is beyond the control of livestock and poultry producer, one common strategy is to apply an organic acid blend to all grain upon arrive at the facility. Generally, the acids applied to grain as preservatives are propionic, acetic, or combinations of these two. Propionic acid has become the dominant acid used for commercial treatment of grain.4 Treating grain with a buffered blend of organic acids has been shown to reduce mold and wild yeast growth, thus preserving the quality of grain until the grain is used for livestock feed. Grain is the most expensive ingredient in most feed formulations. 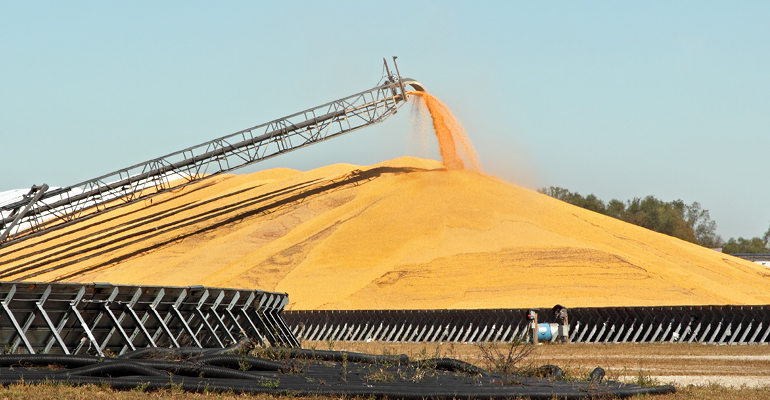 Proper handling of grain, from harvest to final consumption by the animal can help livestock and poultry producers maximize growth and reproduction. Today’s supply chain is filled with opportunities for grain quality to suffer. However, with proper management and storage considerations, grain can maintain full feeding quality from one harvest to the next. Learn more about feed quality here. 1. Woźniak, A & Wesołowski, M & Soroka, M. (2015). Effect of Long-term Reduced Tillage on Grain Yield, Grain Quality and Weed Infestation of Spring Wheat. Journal of Agricultural Science and Technology. 17. 899-908. 2. Tablot, M.T. Moisture Migration in Storage Grains. University of Florida IFAS Extension Publication CIR673. Accesses on February 2, 2018 at http://ufdcimages.uflib.ufl.edu:60080/c501e678815bea981ce49b3b729afc650b3ca58c/613a8cb1-b8f6-bfab-8420-270abdfa70b8/tap2_2YueMO. 3. North Dakota State University News Release. (2016). Long-term Grain Storage Requires Good Management. Access on January 18,2018 at https://cropwatch.unl.edu/grain-storage-management. 4. Loewer, O. J., Overhults, D. G. and Hamilton, H. E. Chemical Preservation of Grain. University of Kentucky Extension Publication AEN-21. Access on January 18, 2018, at https://www.uky.edu/bae/sites/www.uky.edu.bae/files/AEN-21.pdf.